ژولیده‌سر, فرشاد, نوروزی, غلامرضا, نجفی, ارسلان, جهان‌تیغ, مسلم. (1392). تحلیل سطح روند با استفاده از الگوریتم بهینه‌سازی اجتماع ذرات و به‌کارگیری نُرم 1L: بررسی موردی روی داده‌های گرانی منطقه نکا استان مازندران. 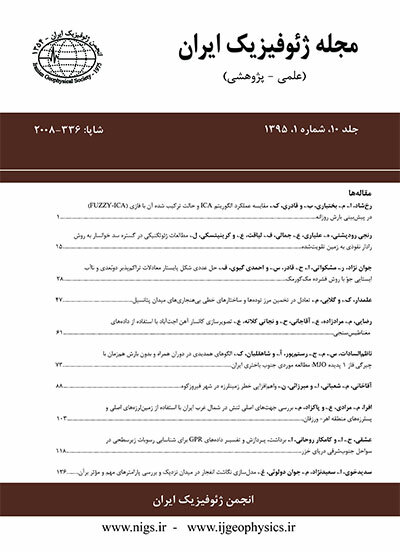 مجله ژئوفیزیک ایران, 7(2), 49-58. فرشاد ژولیده‌سر; غلامرضا نوروزی; ارسلان نجفی; مسلم جهان‌تیغ. "تحلیل سطح روند با استفاده از الگوریتم بهینه‌سازی اجتماع ذرات و به‌کارگیری نُرم 1L: بررسی موردی روی داده‌های گرانی منطقه نکا استان مازندران". مجله ژئوفیزیک ایران, 7, 2, 1392, 49-58. ژولیده‌سر, فرشاد, نوروزی, غلامرضا, نجفی, ارسلان, جهان‌تیغ, مسلم. (1392). 'تحلیل سطح روند با استفاده از الگوریتم بهینه‌سازی اجتماع ذرات و به‌کارگیری نُرم 1L: بررسی موردی روی داده‌های گرانی منطقه نکا استان مازندران', مجله ژئوفیزیک ایران, 7(2), pp. 49-58. ژولیده‌سر, فرشاد, نوروزی, غلامرضا, نجفی, ارسلان, جهان‌تیغ, مسلم. تحلیل سطح روند با استفاده از الگوریتم بهینه‌سازی اجتماع ذرات و به‌کارگیری نُرم 1L: بررسی موردی روی داده‌های گرانی منطقه نکا استان مازندران. مجله ژئوفیزیک ایران, 1392; 7(2): 49-58. یکی از روش‌های حذف بی‌هنجاری ناحیه‌ای از مقادیر برداشت شده در روش‌های ژئوفیزیکی، روش تحلیل سطح روند است. در این روش مختصات نقاط درحکم متغیر مستقل و مقادیر قرائت شده درحکم متغیر وابسته عمل می‌کند. برای یافتن مطلوب‌ترین سطح روند از روش‌های بهینه‌سازی استفاده می‌شود. در این مقاله برای بهینه‌سازی، از الگوریتم بهینه‌سازی اجتماع ذرات استفاده شده است. این الگوریتم، یک روش بهینه‌سازی مبتنی بر جمعیت است و ایده اصلی در آن، مدل‌سازی و شبیه‌سازی رفتار و حرکت گروهی پرندگان در جست‌وجوی غذا است. در الگوریتم اجتماع ذرات هریک از ذرات به‌‌مثابة یک کاندیدای حل برای جواب نهایی در فضای چندبُعدی مسئله هستند. تابعی که در این روش باید بهینه شود (تابع هدف) معادله صفحه‌ای است که نزدیک‌ترین و یا به‌‌عبارتی کمترین فاصله را با داده‌های برداشت شده دارد. بهمین علت برای کمینه‌سازی، احتیاج به معیار‌های طول است. نُرم، یکی از معیار‌های طول محسوب می‌شود. بهترین نُرمی که می‌توان با استفاده از آن جواب‌های دقیق به‌دست آورد، نُرم 1 است ولی در روش‌هایی که تاکنون از آنها استفاده شده به‌خاطر به‌کارگیری مشتق در روند بهینه‌سازی، نمی‌توان از نُرم 1 استفاده کرد. در این تحقیق از الگوریتم بهینه‌سازی اجتماع ذرات استفاده شده و تابع هدف برپایه نُرم 1 نوشته شده است. با مقایسه نتایج به‌دست آمده از این الگوریتم با نتایج به‌دست آمده از نرم‌افزار ژئوسافت روی داده‌های گرانی برداشت شده از منطقه حدفاصل بین نکا و قائم‌شهر در استان مازندران، کارائی این روش نسبت به روش کمترین مربعات و نتایج نرم‌افزار ژئوسافت مشخص شده است. Bouguer anomaly fields are often characterized by a broad, gently varying, regional anomaly on which local anomalies with shorter wavelengths may be superimposed. In gravity surveying, it is usually the local anomalies that are of prime interest and the first step of interpretation is to remove the regional field to isolate the residual anomalies. Several analytical methods of regional field analysis are available which include the trend surface analysis (fitting a surface to the observed data in geophysical surveys) and low-pass filtering. Because the regional changes have a large extent, the regional trend is mostly smooth and uniform. As a result, the trend surface analysis is a good method for identifying regional and residual anomalies. Trend surface analysis is a method for removing regional anomalies in geophysical surveying. In this method, the coordinates of the points are independent variables and the dependent variable is the measured value. Such procedures must be used critically as fictitious residual anomalies and sometimes arise when the regional field is subtracted from the observed data due to the employed mathematical procedures. In this paper a trend surface method is proposed that uses Particle Swarm Optimization (PSO) algorithm for the most desirable surface. PSO algorithm is based on the individual (i.e., particles or agents) behavior of a swarm. Its roots are in zoologist’s modeling of the movement of individuals (e.g., fishes, birds, or insects) within a group. It has been noticed that members within a group seem to share information among them, a fact that leads to increased efficiency of the group. The PSO algorithm searches in parallel, using a group of individuals similar to other. The main idea in this method is to model and simulate the movement and behavior of birds in food searching. Each particle in Particle Swarm Optimization algorithm is one candidate for final result in problem's multidimensional space. The main advantages of the PSO algorithm are summarized as: simple concept, easy implementation, robustness to control parameters, and computational efficiency when compared with mathematical algorithm and other heuristic optimization techniques. The function that must be optimized is an equation for the nearest surface to the measured data as the objective function requires a standard length. For Description objective function need to standard lengths and norm is one of the length standards. The L1 norm is the best norm that can be used until gently resulting accurate. But in the methods used so far, L1 norm cannot be used because of employing derivatives in an optimization process. Procuring of the nearest result to the actual value of the regional anomalies is an advantage of this method. At first, this algorithm was coded in MATLAB software and then it was run on the gravity data measured during a gravity surveying around Neka and Ghaem Shahr cities in Mazandaran province. The results were compared by the least squares method and Geosoft software. The L2 norm is used in this method. Simulation results show a better convergence to the optimum surface of this algorithm rather than the least squares method. Providing the optimum surface with different norms and steps is another advantage of this algorithm. حسنی‌پاک، ع. ا.، 1383، اصول اکتشافات ژئوشیمیایی، چاپ پنجم، انتشارات دانشگاه تهران. حسنی‌پاک، ع. ا.، شرف‌الدین، م.، 1384، تحلیل داده‌های اکتشافی، چاپ دوم، انتشارات دانشگاه تهران. حیدریان، ع.، رنجبر، ح.، 1385، مقایسه کاربرد آنالیز روند در سه روش ژئوفیزیک هوایی، مجله فیزیک زمین و فضا، 3(2)، 23-30. Cameron, E. M. and Hobbs, O., 1971, computerized method for interpreting reconnaissance geochemical surveys, Geochemical exploration (boyle, tech. ed. ): canadian institue of mining and metallurgy, 11, 509. Jacob Raglend, I., Raghuveer, C., RakeshAvinash, G., Padhy, N. P. and Kothari, D. P., 2010, Solution to Profit Based Unit Commitment Problem Using Particle Swarm Optimization: Elsevier press. Kennedy, J., and Eberhart, R., 1995, Particle swarm optimization: IEEE International Conference on Neural Networks Proceedings, 4, 1942–1948. Menke, W., 1989, Geophysical Data Analysis Discrete Inverse Theory: Academic Press, Inc.
Park, J. B., Lee, K. S., Shin, J. R. and Lee, K. Y., 2005, A particle swarm optimization for economic dispatch with nonsmooth cost functions: IEEE Transactions on Power Systems, 20(1), V34–V42. Park, J. B., Jeong Y., Shin, W., Rin, J., and Lee, K. Y., 2010, An improved particle swarm optimization for nonconvex economic dispatch problems: IEEE Transactions on Power Systems, 25(1), V156-V166. Selvakumar, A. I., and Thanushkodi, K., 2007, A new particle swarm optimization solution to nonconvex economic dispatch problems: IEEE Transactions on Power Systems, 22(1), V42–V51.